Once, people thought that imprisoning the Undead and hiding them away would solve the problem, so they created a towering bastille to contain them. 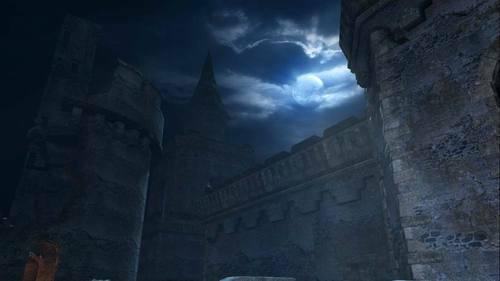 Off the coast of Drangleic is a lonely prison filled with Undead. It can be accessed by a ship that sets sail from No-Man's Wharf. The King sought to contains the curse by removing the afflicted, though it ultimately proved futil and the Kingdom has fallen. The now-Hollowed jailers and Royal Swordsmen continue to prevent the escape of the prisoners. At the heart of the prison though, lies a lost, forgotten Sinner. Undead Jailor: The Undead Jailers of the Lost Bastille carry primitive weapons intended to instill fear and can even use pyromancy to burn escapees, and intruders, to a crisp. The Jailers are wrapped in bandages. What lies beneath? Have they been burned by their own flames, or are they hiding a darker secret? Royal Swordsman: The Royal Swordsman were chosen from the bravest of King Vendrick's men, and provided them with the best armor available for the war against the Giants. However, very few survived the battles. While they may be no match for Giants, they still pose a threat when they attack you in numbers. Enhanced Undead: This deformed, unnatural creature must surely be the product of some serious misdeeds. Who created this monstrosity, and is it what they intended to make? It almost seems to be half-dragon, but, whatever it is, it has a mind of a Hollow. Heide Knight (Spear): Whether Heide was a proper kingdom or not isn't clear, as it fell into the sea long ago. What is known is that the Way of Blue originated in Heide. Equipment from Heide still exists today, as well, which speaks tot he durability of the special allow used in its construction. If this knight truly is from the ancient land of Heide, is it possible that time distortion explains his presence? Vorgel the Sinner (Dark Spirit): In a prison filled with sinners and innocents alike, Vorgel certainly has a special place. He stands watch of the Bastille Key. He wears the armor and dons the shield of a Royal Soldier; perhaps he is one of the wardens of this lost prison? What sins rest in this warrior's den? Ruin Sentinels: The Ruin Sentinel has no physical form; it's merely a Soul haunting a large suit of armor. The Sentinels are the creations of the mysterious "jailer." There are three Sentinels here, with three names: Yahim, Alessia, and Ricce. Were those the names granted to the Sentinels by the jailer, or did they belong to the previous owners of these lost Souls? "So, how long was I sat petrified… Long enough for the old kingdom to have crumbled, I see. Long enough for Olaphis to rise, fall, and fade away, evidently. Why didn't anyone wake me sooner?! Heh heh…"
"Drangleic… I've never heard the name. Is that what they call this place now? Hah hah…Very good, very good indeed." "The cursed ones were imprisoned within this land. Of course, you came of your own free will. Heh heh… The people feared the cursed ones like a plague. Some people would rather keep dreadful things out of sight, out of mind. In the end they swept them up and corralled them here. So very typical of meek minds, don't you think?" "Once people became aware of their own frailty… They seized anybody they found undesirable, cursed or no, and impounded them here. Whoever posed even the slightest threat, was removed. All so that they could sleep better at night. They even turned the great Straid into a stone! Hah hah!" "Once, people tried to round up the Undead and hide them away from the world. They thought that imprisoning the Undead would solve the problem. They created a towering bastille to contain them, but in the end, it did no good. The Lost Sinner lives deep within the bastille. The fool. Trying to light the First Flame…"
Soul of the Lost Sinner, prisoner of Sinner's Rise. The Lost Sinner eternally punishes herself for the sins of her past. Use the special soul of the Lost Sinner to acquire numerous souls, or to create something of great worth. An ultra greatsword forged from the soul of the Lost Sinner. Its blade saps the life of its wielder. The true nature of this sword is unknown, even to the Lost Sinner herself. Those who choose this sword will share the burden of the Lost Sinner's misdeeds. Effect: Attacks also damage player. Mask of the Lost Sinner. Increases equip load. The spikes pointing inward suggests that this was not only used to blind prisoners, but to torture them as well. Effect: Raises equipment load. Hand restraints of the Lost Sinner. Increases power of pyromancy. A device used to restrict use of the hands. By now, no one knows who this was used to punish, or for what reason. Effect: Raises power of pyromancies. Straightjacket of the Lost Sinner. A tightly cinched belt presses against the waist. By now, no one knows who this was used to punish, or for what reason. Skirt worn by the Lost Sinner. A tattered skirt that the guilty wear in shame. By now, no one knows who this was used to punish, or for what reason. Soul of the ineffable. This once-magnificent soul continues to exert influence over the land, even after the eons have reduced it to these remnants. Use it to acquire numerous souls, or to create something of great worth. Pyromancy that imbues weapon in other hand with fire. Adds fire damage to the types of damage the weapon already inflicts. Pyromancy and sorcery are said to be like oil and water, but in fact their origins can be traced to a common source. A katana on unknown origin. Damage to foes also damages its owner. The peculiar pattern upon the blade suggests the sinister nature of this cursed blade. It is an alluring vortex, and a lonely soul. Effect: attacks also damage player. Soul of the Ruin Sentinel, a creation of the jailer. The Ruin Sentinel has no corporeal form. It is only an empty soul that haunts the armor. Use the special soul of the Ruin Sentinel to acquire numerous souls, or to create something of great worth. Armor worn by the jailer's creation, the Ruin Sentinel. The sentinel has no form, its soul residing within the armor itself. Stare at it for long and its seems ready to spring to life, but surely, such is an illusion. Soul of the Gargoyle of the Lost Bastille. The elaborate stone statue on the belfry mysteriously came to life. Use the special soul of this living statue to acquire numerous souls, or to create something of great worth. A two-pronged spear that imitates a weapon mentioned in an ancient text. Gargoyles are said to guard castles and forts, from ill fortune, and they have appeared in many forms in all the great lands throughout history. Some of them are so meticulously crafted that they look as if they might come to life. Key to the cells of the Lost Bastille. Long ago, a bastille lord, driven to desperation by the rapid spread of curse across the land, began to see each subject as a carrier of the blight, and locked them away in droves. This entire bastille was turned into a prison, and left abandoned to rot with its prisoners. This monstrous, contorted sentry was assigned the task of emptying the dungeons of poor, cursed souls. This terrifying lizard-like creature oversees the ferrying of undead into the Lost Bastille. The Bastille is one of your destinations, but will you go as a triumphant warrior, or as an imprisoned hollow? but later twisted to reflect its warped owner. and cast them out to the open sea. of sorcery to the people there. condition, such that it should still function. Only, what lock does this key fit?